Syria says it will leave Lebanon before the country's general election in May. "We will withdraw as soon as possible, without delay and probably a long time before the election," said Imad Moustapha, Syrian ambassador to the US. Syrian troops have already begun pulling out of southern and northern Lebanon, Lebanese officials say. Lebanese President Emile Lahoud is due to begin talks with parliamentary deputies after which he is expected to name a new pro-Syrian prime minister. Mr Lahoud holds a parliamentary majority and correspondents say the consultations are likely to preserve Syria's political influence in Lebanon for the time being. On Tuesday, hundreds of thousands of people gathered in Beirut to back Syria's role in the country, a demonstration which dwarfed earlier anti-Syrian protests. Meanwhile, US President George W Bush has repeated demands for Syria to leave. "All Syrian military forces and intelligence personnel must withdraw before the Lebanese elections for those elections to be free and fair," Mr Bush said. Otherwise, he added, Syria would become "even more isolated from the world". Imad Moustapha told the BBC that even though Syria knew "that the overwhelming majority of the Lebanese are pro-Syrians" it had always maintained that "the moment we believe that our presence in Lebanon will create a rift among the Lebanese people, we will leave". "We will withdraw every single Syrian soldier, but we will do this in a phased, organised way, so that we do not create any vacuum or chaos behind us," Mr Moustapha told the World Today programme. He said Syrian troops would be pulled back to the Syrian Lebanese border region in the Bekaa Valley before the end of March and then pulled out of Lebanon altogether. No exact date has been given for a full Syrian withdrawal. Mr Moustapha rejected US pressure and said Syria had already undertaken democratic reforms and the process would be speeded up with the withdrawal from Lebanon and the resources that would be freed. He said: "There are many ways to introduce democracies. You can send your troops, your armies, and you can destroy whole country like Iraq and then you can say 'Look we have introduced democracy'." "Instead of sending your troops and your jet fighters and your cruise missiles, help Syria evolve towards a more free and more democratic society, which is what we are doing and what we plan to do." Hours earlier, the head of the Syrian-allied Hezbollah group had warned the US, which has been leading demands for a Syrian withdrawal, not to interfere in Lebanon. Organised by Hezbollah, a powerful political and military organisation of Shia Muslims, Tuesday's demonstration dwarfed previous opposition protests urging Syrian troops to leave. Hassan Nasrallah said there would be further demonstrations in other Lebanese towns, including Tripoli in the north, Nabatiya in the south and in the eastern Bekaa valley. 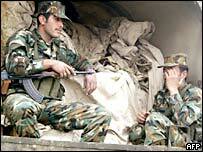 Syrian troops arrived in neighbouring Lebanon as peacekeepers during the 1975-1990 civil war. Since then, Damascus has kept a firm hold on the political and financial spheres in Lebanon. France, Germany and Russia have also called for a Syrian withdrawal, as has its long-standing Arab ally, Saudi Arabia. Did the story you've just read expand your understanding of the issue at hand, or did it leave you feeling none the wiser? Did the story assume too much knowledge of the subject and leave you floundering, or did it oversimplify and leave you dissatisfied with the overview? By many measures the BBC News website is a success, but there's one measure we can't easily judge - the satisfaction of our readers with our material. We value feedback - positive or negative - and we'd like to hear from you. If you'd like to help us to do our job better then let us know what you thought of the story you've just read by using the form below.